You’re home, and you’re hungry. Before you rifle through take-out menus, your first move is to venture over to the fridge. Basking in the cool air and jolt of light as you open the door, everything is in front of you. Vegetables are in their drawer, so are the fruits. Your drinks and condiments are on the door, and the shelves are full of all the main ingredients. The fridge allows your eyes to quickly find the best way to satisfy your hunger. Peter Lynch, Todd Petersen, and Rob de Grasse asked themselves why digital media couldn’t be as accessible and organized as the food in our fridges. Their answer is Digital Fridge, the mobile application that allows users to effectively store and organize all media forms and corral that media quickly later. Digital Fridge started as a way for Lynch to organize all of his family’s media content in one place. He wanted to store physical media, like birthday cards, kids’ drawings, and newspaper clippings, as digital pictures, videos, and notes. Now, Digital Fridge allows users to create digital media from non-digital content, store digital media and multimedia on a secured digital cloud, and organize content in multiple ways to increase efficiency. Users can organize content through tagging, collections, and stacks. Media can be accessed across different folders and collections with tag searches, allowing users to have at their fingertips the content they are fishing for in one search. Once found, the media can be edited, shared, and used to create physical products like t-shirts, mugs, and iPhone cases. Digital Fridge is a solution aimed at making the user’s life easier. That also includes taking away users’ concerns of privacy. 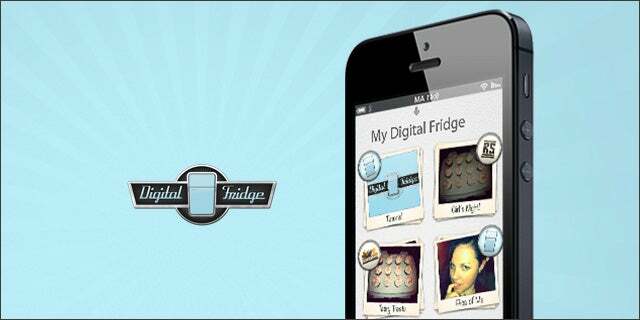 Like your fridge at home, the Digital Fridge app allows you to keep your media as private as you want. The fridge at home is your private, comprehensive food organizing solution. With Digital Fridge, digital media users can leverage the practicality of the fridge along with its second use – proudly displaying content for friends and family to see. Digital Fridge was a showcased startup at the Tech Cocktail Denver mixer.